Gastric sleeve is a restrictive weight-loss surgery, which involves the reduction of the stomach to a much smaller, tube-like structure. 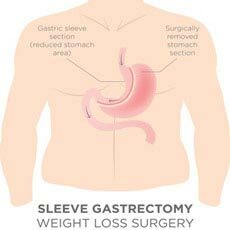 It is the most popular bariatric procedure, but weight-loss surgery is not covered by insurance and most people come to us asking for low-cost gastric sleeve surgery. Gastric sleeve involves cutting your stomach into a smaller pouch, thus restricting the amount of good your can take in and helping you lose weight. The surgery can be performed the conventional way—by making a large incision in the stomach—or laparoscopically—by making several small incisions and passing the instruments and camera through them. More than half the stomach is cut and removed, leaving behind a thin tube like structure, which is closed with the help of surgical staples. The new stomach is shaped like a vertical sleeve and it has a much smaller capacity than your original stomach. Have a body mass index (BMI) of 40 or higher OR have BMI greater than 35 with some weight-related health conditions as diabetes, sleep apnea, joint pain, hypertension, etc. Expect to wake up feeling groggy after the surgery and undergo a variety of emotions. The sutures on your stomach will be covered with dressing and you will feel sore while lying on the hospital bed. You might not feel hungry because major part of your stomach has been removed, but you will feel dehydrated and thirsty. Most surgeons will allow you to have a mouth swab but you cannot eat or drink yet. The doctor will encourage you to walk to encourage blood flow but on the first day it will be difficult to do so. 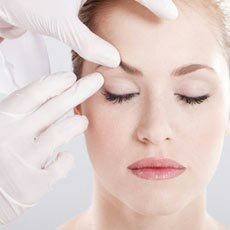 You will feel the pain after the anesthesia has worn off. The pain should be bearable if the surgery was laparoscopic. Movement will cause a little more pain. The radiologist will see you for a swallow test to ensure there are no major leaks before you are allowed to drink water. After that your doctor will check your pain, remove your catheter, and see if you can walk around. You can ask him any questions you have. Some hospitals will discharge you at this stage, but most hospitals in Asia will have you stay for another day or two. The IVF administered pain medication will be stopped and you should expect to feel sore and uncomfortable. Walk around as much as you can. 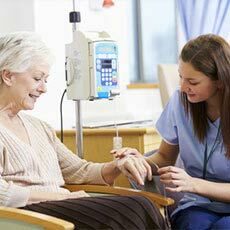 If you are still at the hospital, you will have plenty of help for everything. If you are now at the guest house or hotel, it is advisable to have a companion who could do help you around. This is when you are likely on your own and will feel the most pain because you start to move around more and the pain medication is lessened. You doctor must have given you instructions for pain management. You will mostly feel the pain at the port sites (little incisions on your belly). 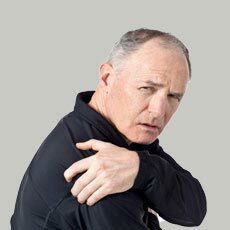 Pain will gradually improve over the next couple of days but if you have excessive pain in shoulders, your back, or some other unexplained pain or fever, you should immediately call your surgeon. Many people fly back home on around day 4 or day 5 after laparoscopic gastric sleeve, but long flights must be avoided for a few more days. Recovery times vary based on your health and the doctor may ask you to avoid flying for 8-14 days. It is recommended that you get a fit-to-fly certificate from the concerned doctor before planning your trip back home. You can also get in touch with us to ask for a detailed treatment plan for gastric sleeve at your selected hospital and get an idea of the required time based on your medical condition. After your new stomach has been checked for leaks, you will be allowed to have only clear liquids such as broth, milk, sugar-free juice (diluted) or gelatin. Caffeine or carbonated beverages are not allowed at this stage. Drink very slowly and do not gulp. After a few days, thicker drinks and shakes may be added at this stage. Sugar-free popsicles, decaf tea and decaf coffee can also be allowed. Still on liquid diet, you can now have non-fat yogurts, very thin creamed soups, non-fat ice cream, sugar free pudding, soup with soft noodles, very thin oatmeal, sugar free sorbet, protein powder mixed in water, etc. You must strictly follow the provided diet chart. After the surgeon has cleared you from your liquid diet, he will introduce some soft pureed foods like mashed beans, yogurt, low-fat cottage cheese, hummus, coconut milk, almond milk, scrambled eggs, lean ground meat, steamed fish, mashed fruit—everything must be finely grounded and should have no solid pieces. It is a good idea to blend solids in liquids like water, juice, fat-free milk. Your body is used to extract fluids from any food you eat but now it’s not getting that. So make sure to keep yourself hydrated by regularly sipping on liquids. Avoid starchy foods like pasta, bread, and rice, as well as nuts and fibrous vegetables like celery, broccoli, and raw leafy greens. Also, keep your sugar intake in check. By now, you must have returned home and your stomach must be able to handle solid foods. It is very important to stick follow the diet chart provided by your doctor. Continue protein shakes, but now you can include foods like sweet potatoes, mashed and baked potatoes, cereal, fruits, fish, hard boiled eggs etc. Chicken and meat should be eaten slowly. Small amount of caffeine may also be allowed but you must avoid pasta, candy, dessert, sugary drinks, fried foods, and sodas of any kind. You are still prone to dehydration, so drink plenty of fluids. Surgeons differ in their diet recommendations and phases and you must ask questions if you do not follow something. There is no fixed answer for that as the amount of weight you will lose depends upon several personal factors—your current weight, adherence to diet, exercise, etc. It is imperative, however, to talk with your doctor in advance and set realistic expectations from the surgery. Gastric sleeve reduces the size of your stomach to 15 – 20% of its original size, and you can expect the weight loss to be proportionate to that. This also leads to the resolution of obesity related co-morbidities within 1-2 years of gastric sleeve. A different Swiss study found that gastric sleeve patients were able to keep off at least 57% of their excess weight five years after their surgery. Stomach may stretch – If you do pay enough attention to diet and lifestyle change, and keep eating the same amount of food you used to eat pre-surgery, the stomach may expand and reverse the results of the surgery. Complications can be avoided by closely following the doctor’s instructions for recovery. You must stay at the destination country long enough to recover well before you fly back home without any major risk. You can use our service to find the best hospitals for gastric sleeve surgery.